So yesterday was Friday, as most of you might have noticed. Along with school back in session football is back in session, no only for the local schools, but in NFL too!! (GO SEAHAWKS!!). So while at my mom’s house yesterday I started to hear some announcers in town, some cheering, whistles, and more announcing. I wasn’t planning on going at first, but my little one decided she wanted to go on a bike ride, so we headed over. When we arrived it was around the third quarter, I couldn’t really tell since the scoreboard was broken. It was a tad bit inconvenient but then again in a H.S. game most of the people go for the atmosphere vs. the actual score. We sat in some bleachers by the snackbar. It was such a great hometown atmosphere already. you had families cheering on the players, friends catching up and grilling burgers, the kids running around playing with all of their new friends, and of course the cheerleaders pumping up the spirit of everyone in the crowd. Almost as soon as we got there my daughter left me to walk around with her friends. Overall it was a great game, the Cowboys won 41-0. Which kinda brought back memories from when I was in high school (we would have been the team who scored 0). 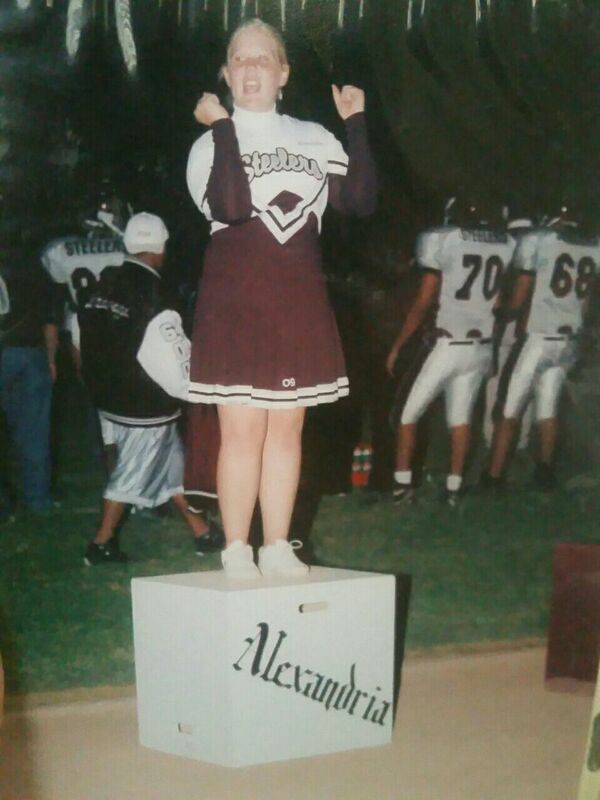 My football team wasnt exactly the greatest but it was fun cheering for them, and yes, I was a cheerleader; only my freshman year though! I most likely will be going back to the next home game they have so you might see some more football posts. So if your not used to football terms better start reading up on it lol, because there are a lot!! Me my freshman year during a game. ← My last week all in one place!